From these works, the name of Harry Hems has become known and respected in every quarter of the world. Locally, the deceased attained, and was jovially proud of, a notoriety that was earned in a variety of ways from a comic distraint by outraged Income Tax Authorities in a battle of wits about a lost city banner. In other parts, however, Mr. Hems was known, first by great enterprises in Business and then by his extraordinary gift of being able to write entertainingly about almost any topic. He claimed, probably with good reason, to have written more signed articles upon architecture, travel and other subjects than upon architecture, travel and other subjects than any other man. In this connection, he was an inveterate collector of facts, and huge indexed scrap books testified to his zeal in preserving all available references to himself, his business, and the things in which he was interested. His two biggest contracts were the restoration of St. Alban's Abbey with its unique screen - a £12,000 job - and in recent years, the erection of the great screen at the Cathedral in St. Louis, USA. Outside business, his most absorbing interests lay in the direction of personal service to the poor. This was expressed chiefly in years of strenuous work for the Devon and Exeter Hospital, the Dental Hospital (which he helped to found), the Ockendon Home (which he also helped to found) and the Hospital Saturday Movement ( in which he was a pioneer). The Christmas parties held in his workshop to which he invited indigent old folks corresponding in number to the years of his age were for long a feature of the festive season. One of the things about which Mr. Hems said nothing was his personal generosity towards a number of poor people. 35' Reredos. in Christ Church Cathedral at St. Louis, USA. Work started with each figure being hand- carved from Beer Stone. The completed screen was sent out to America in 230 cases in 1911. Mr Harry Hems has presented, as a New Year's gift, thirty handsome chairs for the use of visitors to the patients in the three wards forming the Victoria Wing of the Royal Devon and Exeter Hospital. Friends who have used the visiting hours for seeing their relatives and acquaintances in affliction have hitherto had little provision made in the way of their accommodation. 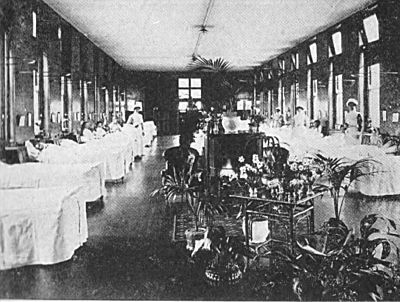 Often coming from afar, they have too frequently had to stand by the bedsides in lieu of being seated, for chairs are few, and it is against the Standing Rules for anyone to sit on the beds. It was as long ago as 1875, that Mr. Hems realised how the patients suffered from the lack of easy chairs, no really comfortable invalid chair existing then in the whole institution. He presented half a dozen reclining ones himself, and what was even better, interested his friends in the matter so that no fewer than thirty were procured, all of which have since done most useful service in the various wards."